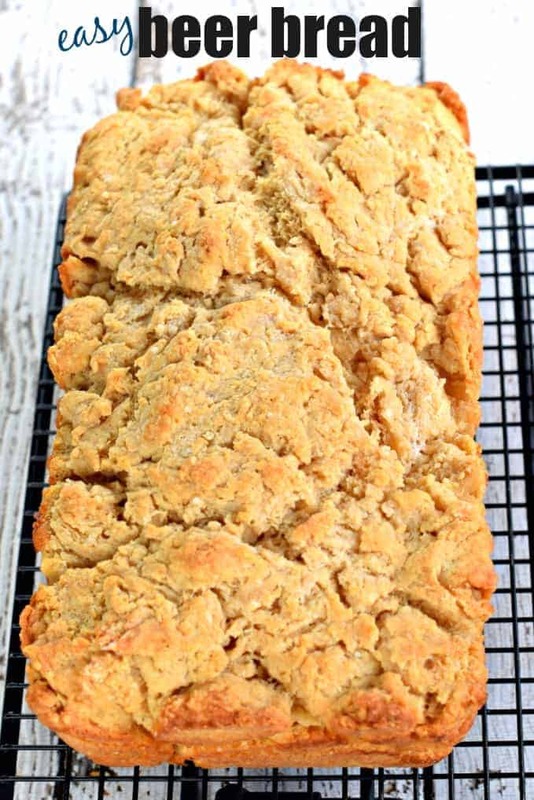 Easy, buttery Beer Bread recipe to serve with dinner! Also great to cube into bite sized pieces and use for dips! I’m hoping my friend Lois isn’t reading my blog right now. She’s my Tastefully Simple consultant. And while I absolutely love their products…I am on a quest to make some of their items from scratch. (like this Corn and Black Bean salsa recipe). 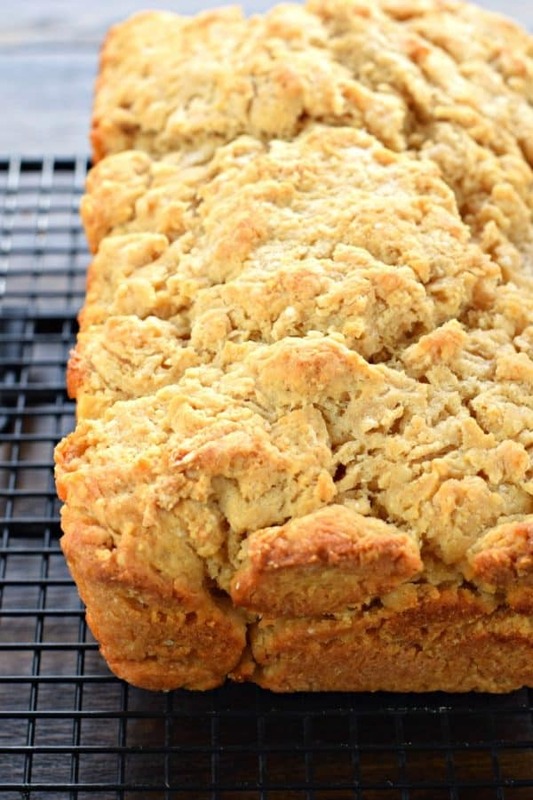 One of my favorite products is the Beer Bread mix (oh and the Cinnamon Muffins, which I made my own recipe for too!). Lois and I used to be neighbors, which was great…I would be making my dinner in the afternoon and pop over there for a box of beer bread mix to bake up with our meal. Until of course, I began making my own beer bread. Sorry Lois! It’s really quite easy to make, I even have a Cheesy Onion Beer Bread recipe on the blog from years ago! “Does it taste like beer? ?”….The answer is no. “Can I substitute anything for the beer?”…You can use 7UP or Sprite instead of beer, however, I find the bread to be a little denser when doing this (still delicious though). “Do I have to add the butter on top?”…Of course not. However, the butter gives this bread so much flavor and since there are no oils IN the bread, you’re not doubling up. I suggest you try it, the buttery top of the bread is one of the best parts! “Can I freeze the bread.”….No. It totally changes the texture and flavor unfortunately. This bread is best served on the same day. Or warm it up to serve with soup and chili on day two! “My bread crumbled when I tried to cut it, what did I do wrong?”….nothing. That is totally normal for this bread. If you’ve ever been to a Tastefully Simple party they will cube the bread to use for dipping in hot dips (like this Artichoke Dip or this Hot Jalapeno Corn Dip). Sometimes you get a perfect slice, and sometimes you don’t! So there you go…one delicious bread recipe to go with any weeknight dinner! Preheat oven to 375°F. Grease 9x5-inch loaf pan and line bottom of pan with parchment paper. Set aside. In a large mixing bowl, combine flour, baking powder, salt and sugar. Using as few strokes as possible, mix in the beer until moistened. Pour thick batter into loaf pan. Drizzle melted butter over the top. Bake for 50 minutes, remove from oven and cool in pan 5 minutes. Remove from pan and enjoy! I used to buy the beer bread mix all the time too, but haven’t had it in ages! Love that you took it upon yourself to make it at home! I’ve made this many times and added variations of – 1+ C. sharp shredded cheese – nuke 1/2 C chopped onion for about 1.5 min – 1/2 C. chopped green olives – 1 tsp Italian seasoning – the recipes is yours to do whatever with – great recipe. 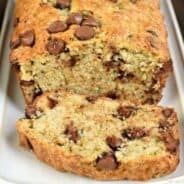 I am a senior citizen and would love this recipe but don’t know how to get it. Can it be sent to my email address please? Please send me the recipe for your onion cheese beer bread. I used to buy the beer bread from Tastefully Simple as well. In order to save some money and wanting to know exactly what was in my food, several years ago my daughter and I figured out our own, which by the way is very similar to yours. I just don’t put in as much sugar or melted butter topping. I love tweaking the recipe…..I have used brown sugar and an apple ale in place of the granulated sugar and beer, added some grated cheese to the basic recipe, used white whole wheat flour for a change, and a variety of dried herb combinations when I want an herb-flavored version. Hi Aimee! 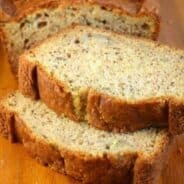 I was excited to want to check out your recipe for beer bread, and the ingredients you listed are what I learned from to make this beer bread about 12 years ago. I would love to offer tips to everyone that I learned along the way for a tasty “beer” bread: 1.) If you want your bread to taste like it has beer in it, use a strong, dark ale – the final bake is delicious! And, of course, the alcohol content burns off during the baking process. 2.) I use all-purpose flour. I once used self-rising flour, omitting the baking powder, but I usually keep AP for other baking. 3.) YES, you really should add all the butter, it makes a huge difference in the taste and texture of the bread. I use 1/3 cup melted butter. 4.) 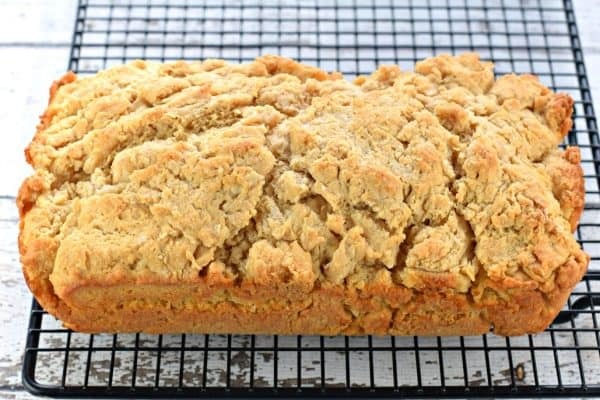 This bread is extremely crumbly if you try to cut into it after it’s been baked and cooled – which is fine if you like it that way. But, I like to make 2-3 loaves one-day in advance and separately wrap each cooled loaf in plastic wrap to sit on the counter for 24-hours to let it permeate its moisture throughout for easy cutting. This also allows for the dark beer flavor to mellow nicely. 5.) What kind of dark beer is best to use? If you don’t have experience with dark beer, ask the liquor store manager who would LOVE to explain to you all the tasty virtues of dark beer, and which ale would work best for your bake. 6.) I usually add one cup of the large golden seedless raisins after soaking them until they’re plump in the same dark beer I would be using for the bread. 7.) And, finally, use a deep loaf pan (8 1/2″ x 4 1/2″) to accommodate the melted butter. This size will also make the loaf look larger than using a regular 9″ x 5″ loaf pan. 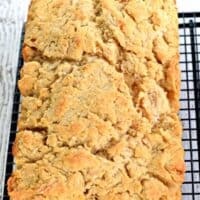 So, those are my experiences with making beer bread – if you’ve never made this before, you will not be sorry, it’s so delicious! 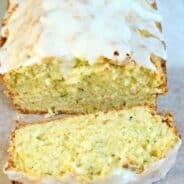 And, as you learn your way around making this bread to your liking, you can add other goodies when mixing the dough for some delicious experimenting. Happy baking! I’ve never managed to make Beer Bread successfully. The last attempt, in a bread machine, caused the machine to attempt suicide by walking off the counter, followed by the pan falling out of the machine and the dough ball rolling across the floor! I assumed this was a message from God not to try to make beer bread any more, but I’ll give you recipe a try! Thank you so much for sharing this great recipe! I made it tonight and it was absolutely delicious! My son is allergic to eggs, dairy, and soy. This was the first time he’s ever had BREAD! ???? I made this on 3/2/17 and we really enjoyed it. I am definitely going to make it again and look forward to trying different beer and perhaps adding some cheddar cheese, caramelized onions or both. Thank you for sharing this awesome recipe! Love these receipes. Look forward to new ok nes.